Cities are often referred to as concrete jungles and the metaphor isn’t entirely inaccurate, as the winding streets and sometimes wild, unpredictability of the urban landscape can sometimes feel like the amazon. In Barcelona, most of the street art that’s left can be found in the old city centre, which I would refer to as a cobblestone jungle, a gridless, touristy labyrinth of the few old-time business mixed in with the overpriced boutiques and occasional chain shops. It’s here that I’ve found some of the more interesting beasts that I post on this blog. 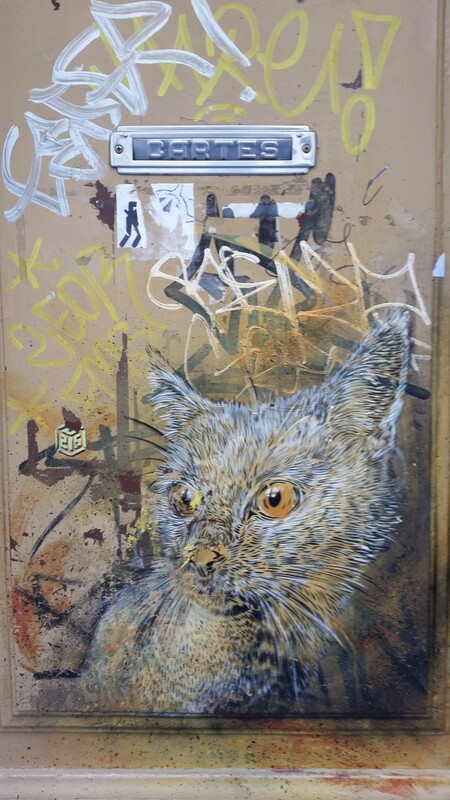 While today’s image by C215 comes from Gràcia, there is no shortage of feline-themed art to be found hiding in the cobblestone jungle.